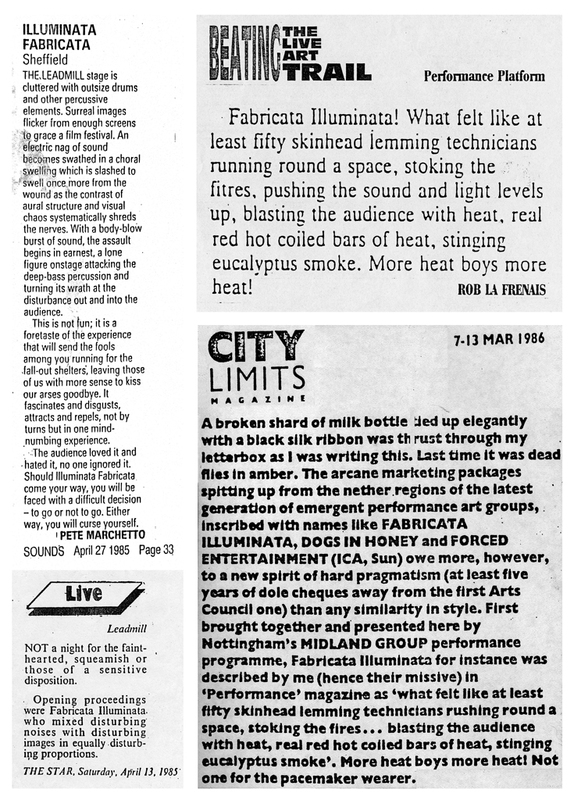 In 1985, following View From Hear and my Scratch video work, I began to concentrate predominantly on work as part of performance art group Fabricata Illuminata. Fabricata Illuminata came about originally as a collaboration between Martin King and Anthony Bennett to produce a sound piece, Fabricata, as introduction to the tape/slide presentation ‘Of Them that Slept’ by artist Roberta Graham and writer Ken Hollings. The work was presented at the Bloomsbury Theatre in London, as part of ‘Violent Silence – Acts of Transgression’ – a celebration of the work of French novelist Georges Bataille, in September 1984, with further presentations at the Midland Group in Nottingham and the ICA in London. By early 1985 the core of Fabricata Illuminata grew to include sound artist Justin Bennett, photographer (and later computer graphics artist) Phil Wolstenholme and myself. We saw our efforts as directed towards collaboration and the exchange of ideas, working together to produce a variety of inter-medial performances, music and videos. We did not think of ourselves as a fixed group and opened the collaborations to include a range of other artists, musicians and friends. We wrote at the time “that we aspire towards a reconciliation of science and art. To this end the inter-disciplinary language used by the likes of Leonardo da Vinci and Athanasius Kircher is sought to be rediscovered and re-fused. The roots of this language are seen to lie in the radical and the trivial, and it is to these poles that we primarily commit ourselves.” Being based in Sheffield during the year long miner’s strike of 1985, witnessing much of the political battles of this confrontation and the police state actions engineered by Margaret Thatcher’s government at the time, informed the political oppositional content of work with Fabricata Illuminata. 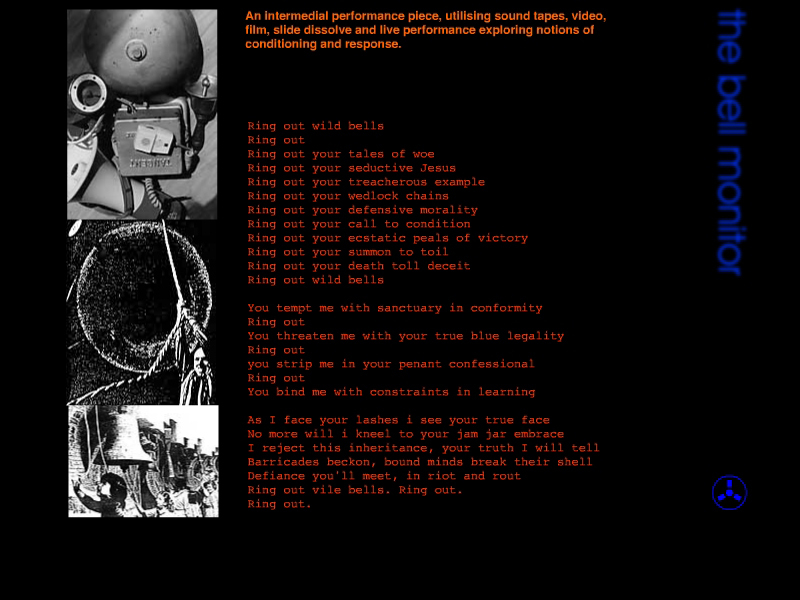 Live performances sought to confront and challenge audiences, using multi-media – slide, film and video projection, live and recorded music and live action; creating immersive environments attempting to transmute the role of audience from passive spectator to immersed participant. The works explored notions of social and political conditioning and response; the tensions and tonicity of riotous situations and the mass morality of violent confrontation; and the encounter of idealism, ideology and pragmatism in artistic production. 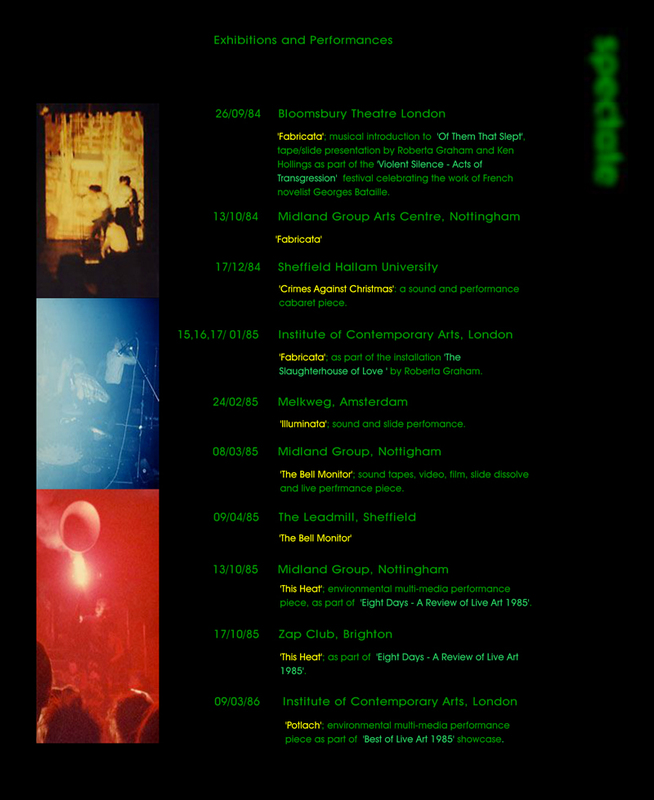 The Bell Monitor was performed at the Midland Group Arts Centre in Nottingham and the Leadmill, Sheffield. 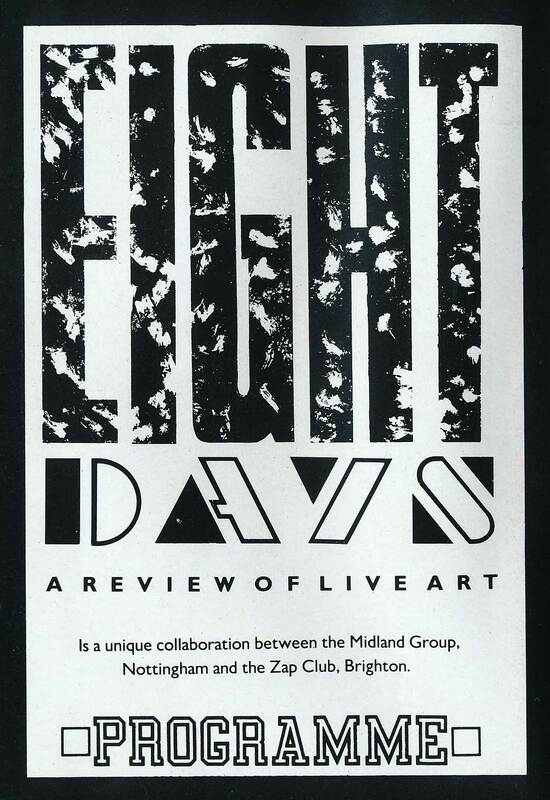 This Heat was selected for ‘Eight Days – A Review of Live Art’ in October 1985 and performed in Nottingham and the Zap Club, Brighton. The final production Potlach was selected for ‘The Best of Live Art’ showcase at London’s Institute of Contemporary Arts in March 1986. The work was first documented online in a Flash-driven website in 2000, available here. The video content of these performances drew on Scratch methodologies, re-editing off air footage and projecting this material as one element of a range of combined media – live and pre-recorded music; film, video and slide projections. Material was also filmed and created specifically, and binaural sound recording and live multi-speaker sound diffusion playback explored too, in addition to expanded cinematic and immersive performative themes. The videos presented here must be seen in this context. 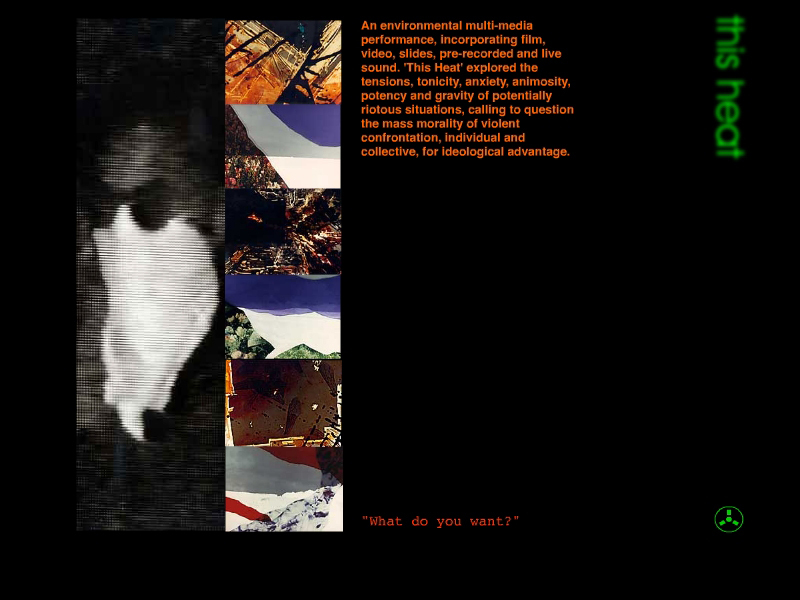 They were not created as single monitor pieces to be viewed as moving image works in their own right, but are each just one element of a variety of media that were used and presented concurrently within live performance contexts. They are however, both documents of work of the time, and give an indication of the content and themes being explored in the wider performance contexts. Included here are a 2’35” selection and a longer 17’46” version of the video material projected as one element of the performance. A live percussion and sound section followed the final section of this video, in the live performance, featuring alarm bells and sirens acquired from Sheffield’s derelict and empty factories. 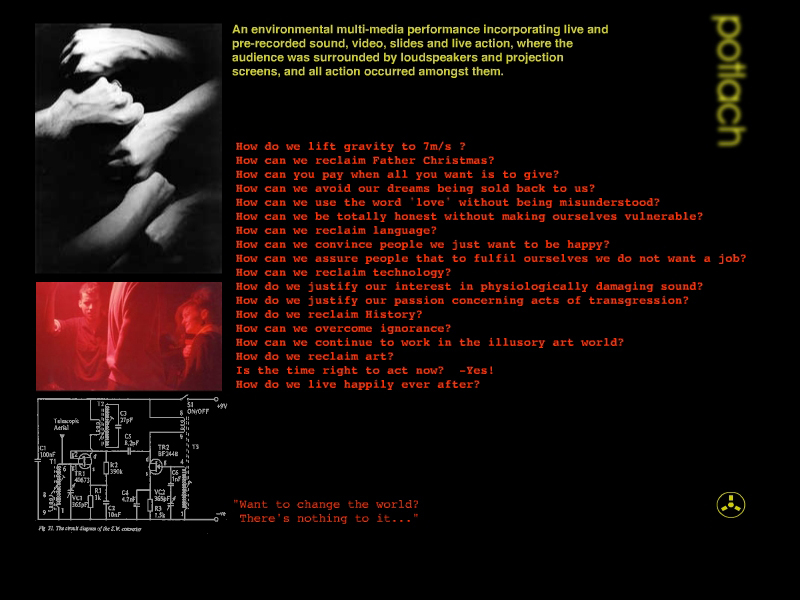 Two versions of the video projection content for This Heat are presented here. The latter is a more recent reconstruction combining the various projection elements of slides, film and video into one video documentation, indicating the kind of montage that was being used through live multiple projection in the performances of this work. The actual performance began with about 15 minutes from the movie Willy Wonka and the Chocolate Factory (1971, dir. Mel Stuart), much to the audience’s frustration… before exploding into live action, sound and flares ( the flaming type not the trousers…) and closing with a calmer, ambient soundscape. The video here encompasses the projection material being shown on monitors at either end of the auditorium, the audience standing between these and surrounded by four stacks of audio speakers in each corner of the room. 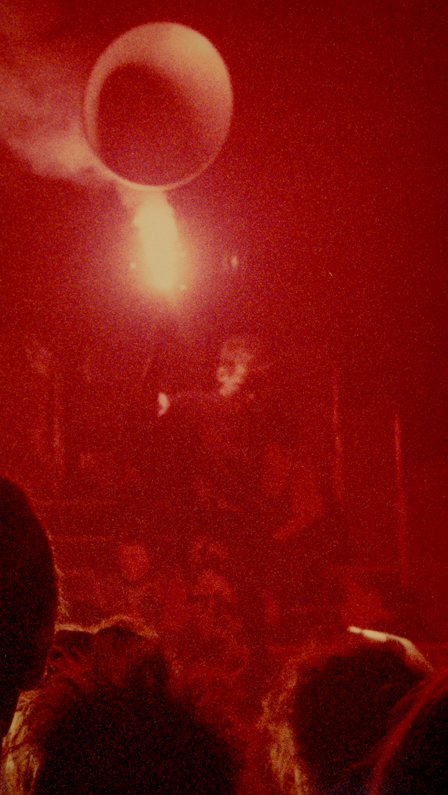 Nick Cope with distress flare, ICA, London, March 1986. Between September 1984 and June 1986 the roll call of collaborators and friends contributing to the Fabricata Illuminata project included Anthony Bennett, Justin Bennett, Jennie Brook, Nick Cope, Darrell D’Silva, Barry Harden, Dave Heppenstall, Martin King, Polly Nash, Adi Newton, Nort, Jane Prophet, Bill Ross, Phaedra Selmes, Ian Smith, Dawn Troop, Mark White, Mari Williams, Phil Wolstenholme, Graham Wrench and Dot Young. Reviews from The Sheffiled Star, Sounds, Performance Magazine and City Limits Magazine. 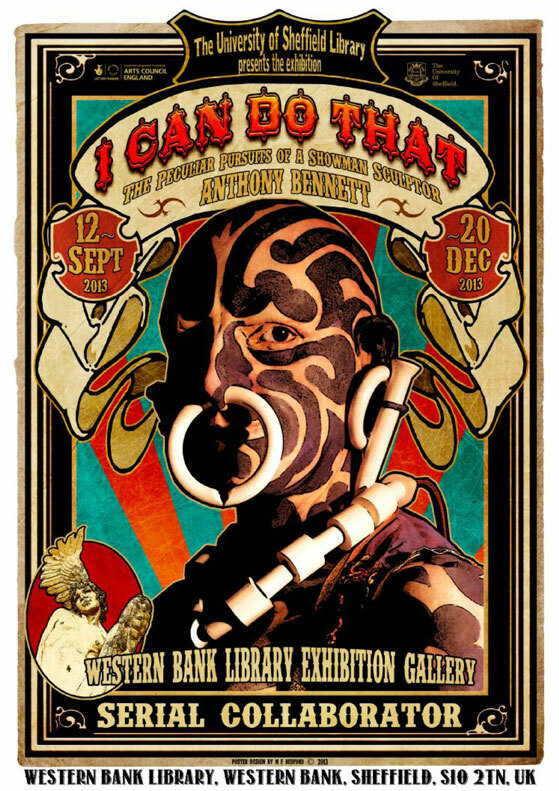 Most recently, Fabricata Illuminata’s work has featured in Anthony Bennett’s exhibition I Can Do That; Western Bank Library Gallery, Sheffield, September – December 2013. Celebrating 30 years of creative collaborations and professional endeavour, Anthony’s exhibition features a showcase of Fabricata Illuminata ephemera, photographic prints of slides and videos.